Since 1980, Advance Iron Works has provided thousands of satisfied Inland Empire, Riverside County, and Palm Springs area residential and commercial clients with beautiful, functional, and affordable iron fences. Our family-owned and operated business has over thirty years of experience crafting and installing custom-designed iron fences for businesses and homes throughout Southern California, and our highly skilled, experienced artisans and craftsmen pride themselves on adhering to only the highest standards of quality workmanship, and build our iron fences to last. In addition, all of our ironwork is carefully constructed and expertly installed in compliance with all relevant municipal building codes and homeowners association CC&R requirements. At Advance Iron Works, we can custom-design, build, and install any type of iron fence for your home or business, including both commercial and residential security and property fences. In addition, our superior quality ironwork is available in a wide range of irons, and we also offer a choice of iron tubing. The backbone of an iron fence is the tubing: and we offer both ornamental and galvanized tubing, for maximum protection against the elements. Galvanized iron comes precoated with a galvanized finish, for the best rust protection available today. Or you can opt for our standard tubing, primed and painted to complement the decor of your home or business. We have a wide selection of standard paint colors to choose from, and also offer custom decorative colors. In addition, we offer custom coatings in enamel and powder coat finishes, which come with a 10 year guarantee against flaking. Or if you would prefer, our skilled craftsmen can install your ironwork with only a primed finish, and leave the remaining finishing work up to you. 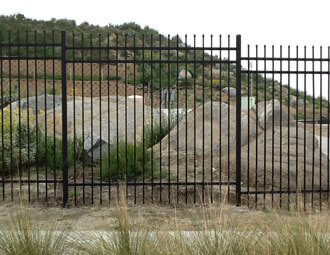 At Advance Iron Works, we also offer repairs on all types of iron fences. Whether your fence has been damaged by an accident, or whether it is time to have your iron fence refurbished, our experienced, expert craftsmen are on call to perform full-service repairs and iron restoration. Please call us today for a free estimate on a new iron fence for your home or business, or to repair or refurbish an existing fence. You are certain to be delighted by our fine quality, affordable craftsmanship and superior customer service.